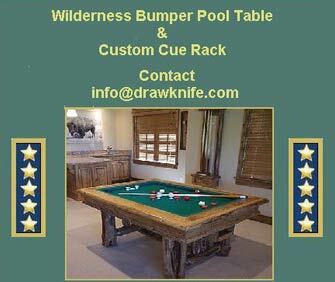 Drawknife Billiards builds hand-crafted, rustic, western, contemporary and custom pool tables and game room furniture. Drawknife's lines include a variety of game tables - billiard, poker, foosball and shuffleboard as well as dartboard cabinets, bars, barstools and other companion pieces to create the perfect family game room. Drawknife’s experienced craftsmen produce all of our unique products. Drawknife is an environmentally aware company, creating our original Yellowstone Collection pieces from seasoned, dead-standing or fallen lodgepole pines from the surrounding Teton Valley forests. Drawknife is located in Teton Valley, Idaho, within view of the Teton Mountains. The Yellowstone Collection, Drawknife's original product group, is a rustic log collection built from local Lodgepole pine in three levels of natural distressing. 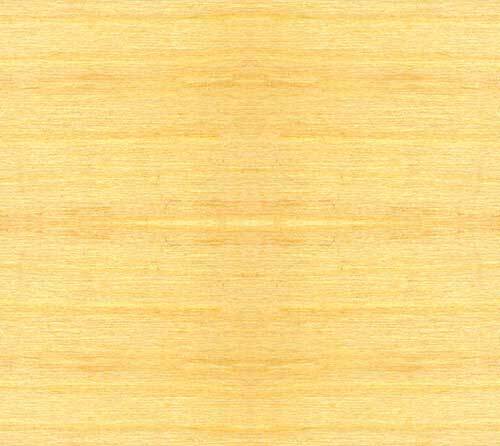 The Gallatin Group, based upon the design of Drawknife's Gallatin billiard table, offers a more traditional style with inset rectangular, log accents. A more recent addition to the Drawknife family of products is the American Prairie Collection, built from distressed Knotty Alder. The basic pieces in this group have simple, rectangular lines, which can be customized in several ways with metal clavos or other trim accents. For a more contemporary look, Drawknife introduced its newest line, the Mountain Modern Collection. With its clean lines and slimmer legs, this style is able to fit into a variety of mountain lodge and lake cottage environments. These pieces can be built in various woods, with a smooth or distressed finish, depending upon client preferences. Click HERE for more information on each of these groups. Drawknife’s award-winning pieces are popular with interior designers because we are able to customize several of our pieces to meet their clients' special requirements. This often involves adding leather or cowhide seats and backs to our chairs, incorporating original artwork or metal hardware into our pieces to create a unique look or working with custom stains for our pool tables and game room furniture. 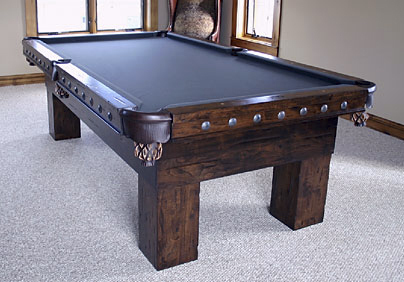 Let Drawknife assist you with plans for your family’s game room.